Alfa Romeo Tipo P1 was the first Grand Prix car made by Alfa Romeo in 1923. The car had a 2.0 L straight-6 engine and it produced 95 bhp (71 kW) at 5000 rpms. 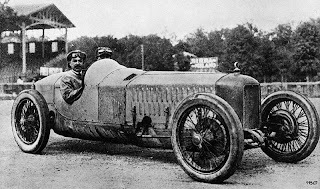 Two cars were entered in the Italian GP at Monza in 1923, one for Antonio Ascari and one for Ugo Sivocci. When Sivocci was practicing for the GP in September 1923 he crashed and was killed. Alfa Romeo withdrew from the competition and development of the car was stopped. In 1924 a new version with Roots-compressor was made and became the P1 Compressore 1924. In 1923 Vittorio Jano was hired to Alfa Romeo to design new car and P2 was born. Last updated on 10 March 2014 at 10:16.